The way I interpret this: The backers just funded a demo reel. This is shown to investors who then decide “Yeah, I’ll back this…” or “ I’ll get back to you…” Rarely are demo reels ever seen by the public, but with the Internet people have been leaking demos out to get the buzz going again. While this project is visually stunning and offers wonderful steampunk imagery, the return of classic 2D animation in that Classic Disney/Don Bleuth style, and terrific characters encouraging science and technology for girls, I’m all in. Believe me, I want this. If I am interpreting this correctly, though, this IndeGogo was for a demo reel for investors. It could make the rounds in Hollywood (again and again) and we’ll never see anything beyond breathtaking stills and the Kickstarter video. Provided all is in the green from this point on—and considering the success of their crowdfunded campaign I can’t imagine the production having any issues financially—and the demo reel is completed, that hardly means a series is going to happen. Investors have to step up, and they will be looking at other factors beyond the brilliant glimpses we’ve had of this world. They will weigh in the appeal of 2D animation against the 3D animation that—let’s be honest—audiences have grown accustomed to seeing. It’s a bit like going from IMAX to black-and-white films. They will also look at the voice talent and say “Yeah, I’ll back this…but who are the A-listers that will guarantee butts-in-seats?” Then you have cost of these talented artists. For hand-drawn animation. That’s what I’m picturing off the top of my head and how I understand production costs. (As some of you may know, I’ve got some experience behind the camera as well as in front of it.) When a producer sat down with me and Pip to talk about the potential of a web series, I had questions. I’m sure investors will ask other questions. Those questions, as I found out in my discussion with this independent filmmaker, adds to the cost of the project. Also, I know one of its producers was a driving force behind World of Steam which also showed great promise only to stall hard after Episode 1. World of Steam is not the only crowdfunded project to surpass goals only to go nowhere. Auror’s Tale was a Harry Potter-inspired web series that never made it beyond the trailer. Time and again, be it crowdfunded short films, web series, or video games, crowdfunded projects that promise the world and surpass their goals wind up somewhere in development hell. It’s been two years since World of Steam’s successful Kickstarter, and we are still waiting. And since I mentioned “Development Hell” should I ask about the status of Boilerplate that J.J. Abrams picked up? What about Bruce Boxleightner’s ambitious steampunk epic Lantern City which had cast locked in for a pilot episode? And when will WETA decide what to do with Dr. Grordbort from Greg Broardmore? Video game? Television? Film? Animated? I’m dying to know! 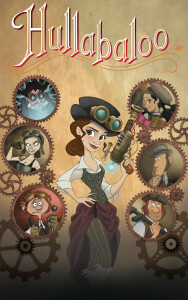 I don’t believe steampunk is overdone or dead, but I do think it is still a hard sell for television and film. It’s a combination of Victorian flair with technology, and that can be hard to keep economical. 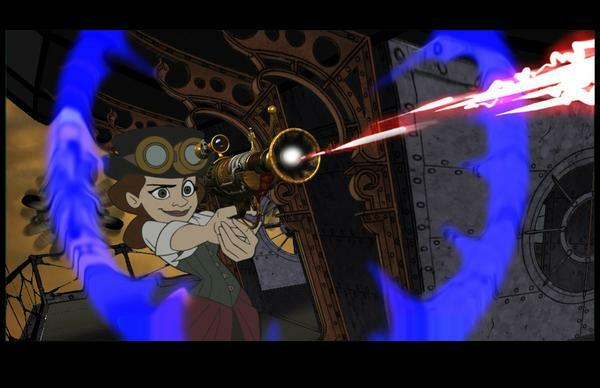 Especially with hand-drawn animation — a style befitting of steampunk, and an art form I’d like to see return. I love 3D animation, but technology is no replacement for animation like The Black Cauldron, The Secret of NIMH and An American Tale. I wish Hullabaloo all the luck in the world; but a long, twisted road now stretches ahead of them. I won’t get excited until we get a release date. I wouldn’t call their films a demo reel. If you read through the entire proposal the animators, all Disney vets including Minkyu Lee Academy award nominated for his animated short Adam and Dog two years ago, are making 2 possibly 3 short films. Yes, it is to show investors, but those films can be entered into short film festivals and potentially earn awards which then also attract investors. The “dying art” of 2D animation is actually quite alive and kicking in the world of short films which have a wider range of styles than what gets made for full length, except in Japan. Di, thanks for the comment. Glad to see you comment, too. Today was brutal! Hope tomorrow’s humidity is lighter at the Grove. Concerning the column, this is why I said “The way I interpret this” because after reading it (*wags finger* shame on you for thinking I didn’t read the whole proposal. 😉 ) I walked away thinking “Hold on…this is a demo reel.” This was my take on it, and with the amount of money they have raised, animated short films are still costly. If they can make multiple short films for competitions and such, that wold be great. I got the impression, especially from the reaction of people who pointed me to this project, that backers believed this would help make this project happen. My point was this IndeGoGo will help Hullabaloo happen, but this is just a first step. It’s a long road ahead, not a done deal. For the record, _I_ didn’t say 2D animation was dying. That was the Hullaballo creator, not me. People have been tacking that claim on me…and I didn’t say that. I did say the style suits steampunk. And yeah, I really want this to happen, but I’m going to wait and see. I think Diane Wilshire is right. The demo reel will be a short. The stretch goal that has been achieved is two shorts and they’re close to a third one. But you’re right, that’s a long stretch between those and a feature length movie.